NEW DOORS OPEN TO MEDJUGORJE! With the Vatican’s Papal Envoy to Medjugorje confirming that official pilgrimage is authorized and the recommendation from the Ruini Commission that the first seven days of the apparitions be approved, there’s never been a better time to increase your understanding of the miraculous events taking place in Medjugorje! 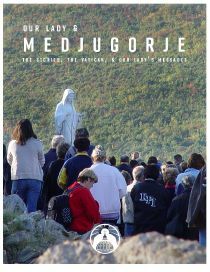 Responding to these newly opened doors, we have compiled a FREE comprehensive guide to Medjugorje to offer you a deeper understanding, appreciation, and reverence for this holy site. The Vatican’s response to the apparitions and conversions taking place in Medjugorje today. It starts with a stirring…an ache…a longing to withdraw from the everyday and grow closer to Our Lord. Our Blessed Mother invites you to visit one of the most spiritual and peaceful places on the planet, a place of spiritual growth and conversion where she still appears today. The visionaries tell us that no one goes to Medjugorje by accident. How will you respond to her loving invitation? After 5 days in Medjugorje, one of the greatest places of conversion in the world today, pilgrims will travel to Krk Island, for a 3-day retreat with Fr. Zlatko Sudac. This will be a Spirit filled encounter with the Lord, through daily Mass, talks by Fr. Sudac, prayers for healing and deliverance. The pilgrimage will conclude with 2 days in the charming Old City of Zagreb. Fr. Leon Pereira, OP, Chaplain to the English-speaking pilgrims in Medjugorje, explores the main messages of Medjugorje by comparing them to the 5 stones by which David defeated Goliath. Watch Fr. Leon’s introduction to the 5 stones of Medjugorje. The Bible tells us “You shall know them by their fruits” Mt 7:20. The fruits of Medjugorje are abundant, varied and have already had tremendous impact on the Church. Between 40 to 50 million people from throughout the world have travelled to Medjugorje since the apparitions began. It has become one of the most visited pilgrimage sites in the entire Catholic world. Millions of people have claimed that their lives have dramatically changed since visiting this simple, humble little village. In addition to these spiritual conversions, there have also been hundreds of documented, instantaneous physical healings that have occurred in or through Medjugorje. but during the busier times of the year, that is not enough to meet the needs of all the people who desire to make their sacramental confession. It is not an unusual sight to see huge lines of people all over Medjugorje, waiting in line for hours to go to confession. The parish of Medjugorje has documented close to 1000 men who found their calling to be priests in or through Medjugorje. There is no other place in the Catholic world that has produced this many priests in such a short period of time. 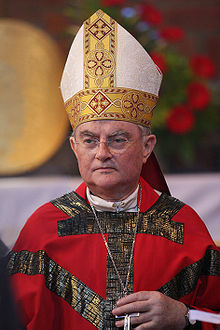 Cardinal Schonborn, of Vienna Austria, who is an ardent supporter of Medjugorje, has publicly stated that, were it not for Medjugorje, his seminary would be empty. In 1981, when the apparitions first began, the devotional practice of Adoration of the Blessed Sacrament was considered a pre-Vatican 2 practice, and largely abandoned throughout the Church. As millions of pilgrims began to journey to Medjugorje, however, they encountered the power of adoration on their pilgrimage and wanted to bring that practice to their home parishes. Medjugorje, almost single handedly renewed the devotional practice of adoration to the Church. Thousands of “Medjugorje” prayer groups have been formed throughout the world since the apparitions first began, as a way to continue to live the spirituality that people encountered through Medjugorje. I had a vivid and clear change of heart regarding forgiveness and ran to confession during the retreat with Fr. Sudac. Only God could put together such an experience. He used the best disciples to lead us – Ann and David did an amazing job. when my heart opened to Mary, Jesus and God, and I was then all consumed. Medjugorje and Father Sudac’s retreat were amazing. In 2010, Pope Benedict established a commission to investigate Medjugorje and to make recommendations regarding the authenticity of the events (called - The Ruini Commission). The commission completed its work in 2014, and it was later revealed that the commission recommended that the first 7 days of the apparitions be approved. We are still waiting on the Holy Father to make a decision regarding the recommendations of the commission. Read the complete timeline here. Fr. Zlatko Sudac was born, the oldest of 2 children, on January 24th, 1971, in Rijeka, Croatia. He grew up on Krk Island, which is the northern most island on the Croatian Adriatic coast. In his early 20’s, Fr. Sudac discerned he was called to the priesthood and was ordained a priest of the Krk Diocese on June 29, 1998. In May, 1999, 11 months after he was ordained, something very unexpected happened which changed the trajectory of Fr. Sudac’s life. Fr. Sudac received the first mark of the stigmata on his body, which came in the form of a cross “imprinted” on his forehead. In an effort to understand this phenomenon, his bishop asked the young priest to submit himself to testing, which Fr. Sudac agreed to do. The examination of the cross on Fr. Sudac forehead confirmed that there was no medical explanation for its formation. Almost a year and a half after Fr. Sudac received the cross on his forehead, his life was again touched by Divine Grace in a unique and special way. It was the early morning hours of October 4th, 2000, feast day of St. Francis of Assisi, when Fr. Sudac received the wounds of Christ on his wrists, feet and side. For many years, Fr. Sudac served as the spiritual director of Bethany Retreat House, on Lošinj Island, Croatia, leading retreats for people from all over the world. Today, Fr. Sudac continues his retreat work and ministers to multitudes on Krk Island, Croatia. 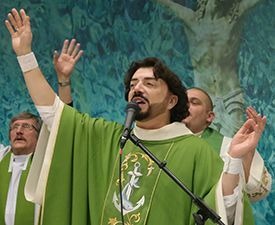 In addition, he often travels to other parishes in Croatia, Bosnia-Herzegovina and beyond, where he does parish missions and retreats. While his powerful gift of preaching has touched the hearts of countless numbers of people, he is also an extremely gifted artist, who uses his creations to preach the Gospel message through a visual format. Whether its through his preaching or paintings, through his teaching or sculptures, through his retreats or stain glass windows, the goal is always the same – to lead people to a deeper and more intimate encounter with the Lord Jesus, and to be more passionate about living their faith as Catholics. Ann Vucic was born in a village 2 miles away from Medjugorje, Bosnia-Herzegovina (place of alleged Marian apparitions since 1981) but her family moved to the USA when she was 2 years old. In the summer of 1981, when she was 15 years old, Ann returned to her homeland for a summer vacation and was a witness to the beginning days and months of Our Lady's apparitions in Medjugorje, which profoundly changed her life. 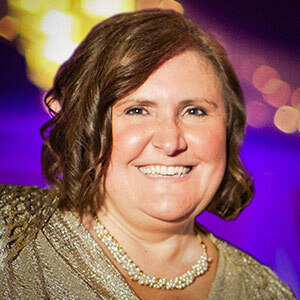 Ann completed undergraduate studies in Theology and Psychology (1988), and graduate studies in Social Work (1992) at Loyola University Chicago. By 1999, after many years of working in the field of Social Work, Ann discerned a call by the Lord to leave her career and begin a new life, fully committed to evangelization and ministry. Shortly after that, Ann met a young, charismatic Croatian priest with the stigmata, named Fr. Zlatko Sudac. She spent the next 7 years primarily living and working at Bethany Retreat House, on Losinj Island, Croatia, of which Fr. Sudac was the spiritual director. She worked there as coordinator of retreats for English speaking pilgrims, as well as Fr. Sudac’s interpreter for the retreats. Ann is now living in the United States again but continues to work extensively with Fr. Sudac in the same capacity. In addition, Ann coordinates and directs pilgrimages to Medjugorje and other Catholic pilgrimage sites and has interpreted extensively for Medjugorje visionaries and priests throughout the USA. Ann is frequently invited to share her testimony, speak about Medjugorje, or matters of faith and spirituality at retreats and conferences throughout the United States.